From the attempt to assassinate Hitler in July 1944, to orders to shoot dead any German soldier seen fleeing Riga as a cowardly traitor, the Hut 3 Headlines tell a story of World War Two in tiny snippet form. They were succinct summaries of Enigma messages sent by the German army and air force, intercepted and deciphered by Bletchley Park. These messages were then boiled down to the barest essentials to be sent to the Prime Minister, Winston Churchill. He’s reputed to have wanted to know everything that was happening, and it’s well established that he was a firm proponent of the power and importance of signals intelligence. 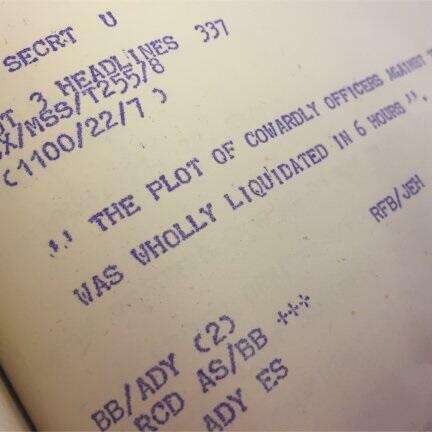 But no one man could have waded through the mass of information flowing through the Government Code and Cypher School, let alone a prime minister in the middle of an all-out war. So the Hut 3 Headlines became regular, and sometimes frequent, digests of what he needed to know. Bletchley Park has been digitising these precious documents and now, for the first time, has published a batch of ten, online. In this It Happened Here episode, we get the stories behind the headlines, with help from Bletchley Park’s Research Historian, Dr David Kenyon. We also meet Denis Falvey, one of the dedicated team of volunteers diligently digitising this precious archive and Florence Morgan-Richards, Bletchley Park’s Digitisation and Archive Assistant, who runs that project. We also take you inside the Archive to meet Senior Archivist Guy Revell, who explains why it’s important they’re not kept hidden away. Special thanks go to Mr Ben Thomson for playing the part of our Hut 3 Intelligence Officer in this episode.